Monuments Sight Seeing Attractions Jewesh Synangue Little evidence, all of which is circumstantial at best, exists to substantiate the Jewish Exodus from Egypt. Monuments Sight Seeing Attractions Jewesh Synangue history. The first reference to Israel is found in the so-called Israel Stele, inscribed during the fifth year of the reign of Merenptah in Egypt’s 19th Dynasty. Though evidence of actual Jewish residence in Egypt occurs much later in Egypt, there were certainly earlier reference to them between the time of Merenptah and later periods. Although Jewish refugees probably fled to Egypt after the Babylonian conquest of Palestine (Jer 42:14–22) by Nebuchadnezzar when they were dispersed throughout the known world, we really have no good evidence of such from archaeology in Egypt. It was probably not until the wars of Ptolemy I against the rival successors of Alexander the Great (320–301 BC) that the first scale immigration of peoples calling themselves Jews into Egypt. Invading Palestine four times in those wars, Ptolemy I is said to have “removed from the land of the Jews into Egypt up to one hundred thousand people, from whom he armed about thirty thousand chosen men and settled them through the land in the forts” (Ep. Arist. 12–13). While Aristeas’ numbers are likely exaggerated, various papyri, inscriptions and ostraca from the third century BC nonetheless testify to the presence of substantial Jewish populations in all parts of Egypt. 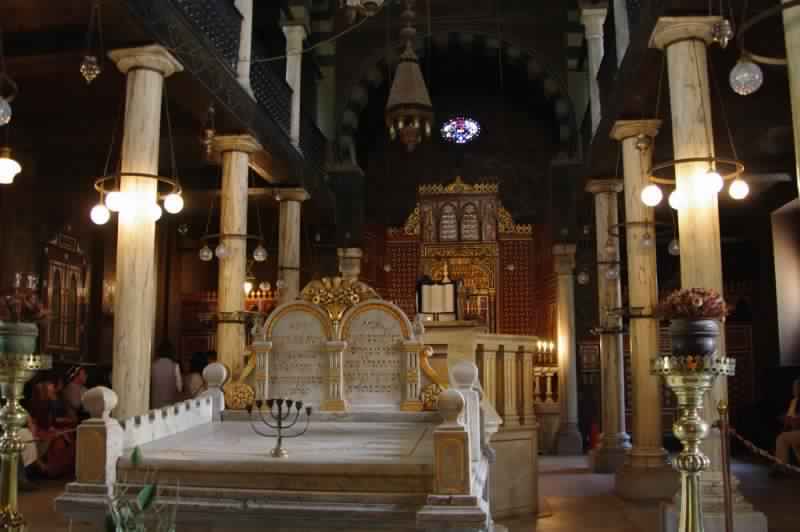 the oldest existing synagogue in Cairo, Ben Ezra Synagogue was originally a church, built in the sixth century near the Roman Fortress of Babylon in Old Cairo. In the ninth century Jews bought the church and a large piece of land surrounding it. For the Jews, the synagogue has great historical, spiritual and religious importance: it is also supposed to be the first place where Moses prayed. This famous synagogue in Fostat (Old Cairo) was called originally the synagogue of ‘the men of Israel’, built in the year 882 on the remains of the basilica of a Coptic church that had been sold to Jews. 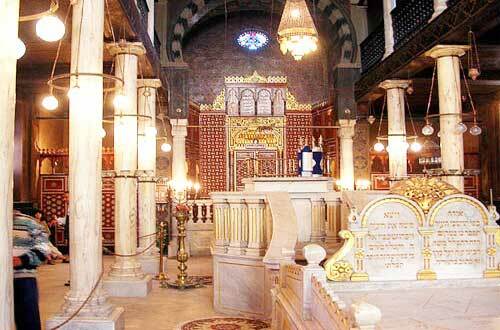 It became known as the Synagogue of Elijah the Prophet and as the Ben Ezra Synagogue. One of the most famous Jews of the Middle ages, Moses Maimonides (Moshe Ben-Maimon -HaRambam), physician, philosopher, authority on religious law, worshipped at this synagogue while living in Cairo, as a result of which it was popularly called the Maimonides Synagogue. During a restoration process in the 1890’s, a discovery took place: a medieval Geniza (hiding place) was found. Sacred books and worn-out scrolls of the law were put away in the Geniza. 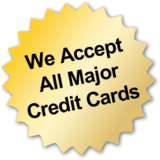 Thus, thousands of original documents of the Middle Ages were found. From the 1980’s the synagogue went through a restoration process and today it is an historical monument and one of the most visited Jewish sites. Cairo, 10th century Museum of the Jewish People Tel Aviv University The mutual architectural influence of Jews, Muslims and Christians appears clearly in the Ben Ezra Synagogue. Christian influence shows in the building style itself, which is reminiscent of a basilica. The ceiling is supported by 12 marble columns. Motifs used in many churches, like vines, sheaves of wheat and olive branches are also in evidence. Islamic influence is even more evident on the carved wood and the two chandeliers, on one of which are engraved the names of the four Rightly-Guided Caliphs. On the other, the name of Sultan Qalawun is inscribed, also in Arabic. Jewish symbolic and decorative elements include the star of David and the menorah.